It's a great album - having the mix of instrumentals and normal songs works really well, and the power trio format sounds great. 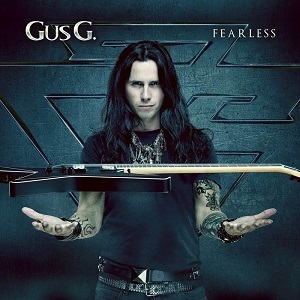 For his new album, Fearless, Gus G has gone with a power-trio setup, working with Dennis Ward (Pink Cream 69/Unisonic), not only as producer, but also playing bass and doing vocals, while Will Hunt (Evanescence, Black Label Society) plays drums. It’s the first time that Gus G has played in a power trio but listening to the results I suspect it’s something he may well do again. While Firewind is power metal, Gus’s solo albums are more hard rock/metal which works well as it gives his solo material a different sound to his work with Firewind. On this album he’s included some instrumental tracks – four of them. It works well as they allow him more freedom to really show off his guitar skills, whereas with the full songs, he’s got to reign it in slightly so the playing and solo suits the song without overpowering it. On the subject of the songs, they’re really good – while some guitarists seem to do a solo and then stick a few riffs around it before adding vocals and other instruments (which always sounds disappointing), these are proper well-written songs which happen to include great guitar playing. Check out the lyric video for “Mr Manson”..
Tackling a cover of a well known song is always tricky – if it’s too close to the original then what’s the point in doing it, but when you change a classic then it’s like marmite – some will love it, some will hate it, so when Gus G decided to cover the Dire Straits hit “Money for nothing” then it was certainly a high risk strategy. How did it turn out? I’m in two minds about that. The intro is fine until that famous guitar line which I think just fails to impress, but once the main part of the song starts then it’s a different story. This version of the song is definitely different to the original but it works very well – it’s a much harder and heavier version and really does sound good. Had that intro been a bit different I’d have loved the track, but I just don’t like the intro. It’s a great album – having the mix of instrumentals and normal songs works really well, and the power trio format sounds great.